Backplates can be used in conjunction with cabinet knobs or pulls for a decorative effect. You can also use backplates to cover the previous screw holes or damage when replacing existing cabinet knobs or pulls. 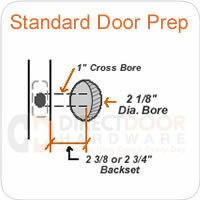 Pull backplates must have the same center to center measurement as the cabinet pull you are using. We recommend using the same manufacturer for the knobs or pulls as the backplate for an exact finish match. Baldwin 4613 Round Edinburgh Backplate - 1.5"
Baldwin 4619 Oval Edinburgh Backplate - 1.5" x 2"
Baldwin 4901 Knob Backplate - 1.375"